This post is about a new friend I have made recently. Her name is Adriana, who is originally from Mexico but now settled in Texas since about a decade. We became friends because I was a frequent visitor at her über trendy store. Previously, known as "The Shoe Club"; it is now called "Cork" and has all the trends du jour! I can always bet that I would find the cutest dresses and *drool* worthy shoes at this store. This fashionista is not only a savvy business woman but also a mother of two younglings and [beat this!] also has a Ph.D in Chemistry! Of course, she exchanged the lab-coat for fashion accessories and clothes! Clearly, the laboratory didn't do justice to her fun & stylish spirit! 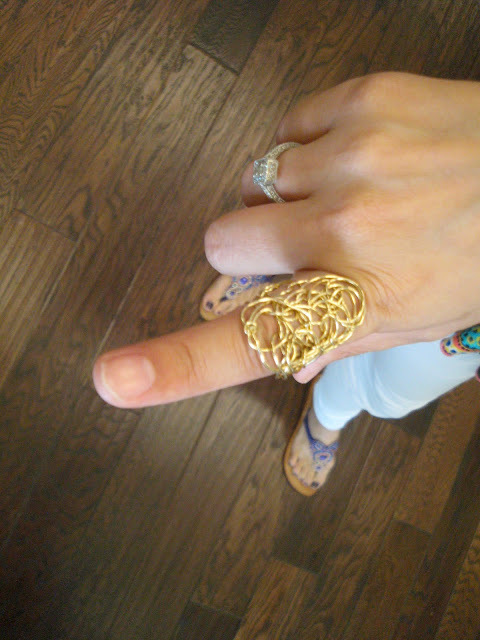 And this lovely wire ring by Cassandra Collections! Love your top which is similar to J Lo. and it is exactly same. wowwww..
GO GET THE TOP! what are you waiting for? if you need an occasion...does the word "graduation" ring a bell?? :-p Return present for being such an amazing support? J Lo competes with T Ra! (and T Ra wins hands down) :-p nowwww will u share the paisley top with me????? JLo's looks dirty, and her hair looks wet... you definitely win this match. That top is totally awesome! Love the colors. Ring's great too! Girrrrll... I think you just showed J.Lo what's up! You look great! buy the paisley top:-)Love ur JLo top too.. I love her top...arent frills like the ultimate girly thing ever? I also love the chappals she's wearing with them. And you my dear, are rocking that dress far more than JLo is! And oh, your nose ring is super hot! I cant get over how bloody gorgeous you are! And about Fashion Blogging....you think it will be a good idea? But then what will I write in it? I lovee that wire ring! Firstly your friend Adriana sounds awesome! Great style AND smart, too; winning combination. And I love that dress you're wearing, how cool that J Lo has a similar one! Ooooh! I love that gold ring!! im not j'lo's biggest fan, you carry it off way better!!! Plus I just started a competition for a Topshop voucher and mystery prize!... Please enter Topshop Competition! THE TOP IS REALLY NICE...AIR OF SUMMER! Now you know what your next career move can be??? Fashion By He - Thansk!!! Will drop by sooon! The Goddess of Boho - I love her style too. Always like her on the red carpet! Le Jardin - Me tooo! Cinderella - Aren't you the sweetest, kindest and the prettiest girl around? Thanks doll. Thanks for all the compliments ... I have this nose ring for almost 11 years now. It's kinda my thing. Some places (here in US) where people don't know my name refer to me as 'a girl with the nose ring' and I LOVE IT :) ... You shld get it! It will suit you very much!!! KISSES!!!! P.S. Fashion Blogging will be an excellent idea for you. You can write what you wore and why? How do you decide what to style your outfits with. What inspires your dressing? Etc?! :) Try it!!! Upasna - There is a shop by that name?!?! WOW! I absolutely will. Shall tell my Mom to remember it ... hehe ... and it is inspiring when people follow their passions in spite of all odds. Smrithi - Hehe! Darling ... I just adrore you! :) ... Thanks for you vote of approval. JLO watch out ... now I am coming to get you ... hehe!!! kirstyb - Gotta go get it now, I guess!!! Prutha - :o) Thanks!!! Shall visit you soon! You wore it way better hon! What's with J-Lo's greasy hair? That ring is so HOTTT!! We're in love. WHOA Tanvi, just look at you ..Really a fabulous fashion face-off! You look no less than that diva..really! Ths post was lovely beginnning from your friend in that paisley pink top to the wired ring and your chic dress..HAUTE HOT mama! !